. 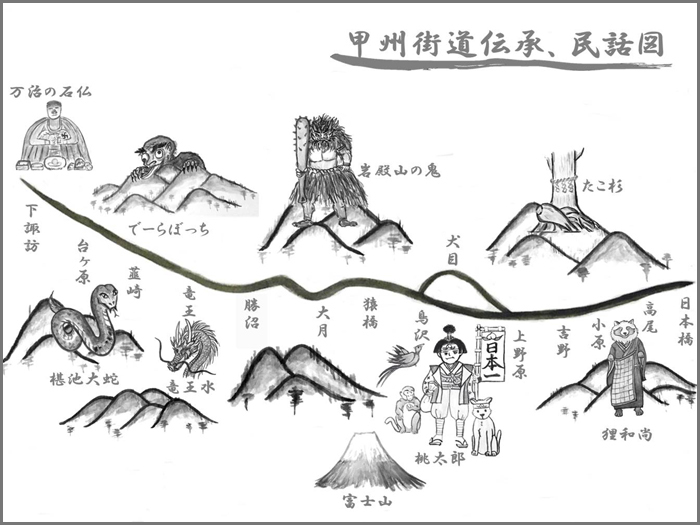 Kaido 日本の街道 The Ancient Roads of Japan . 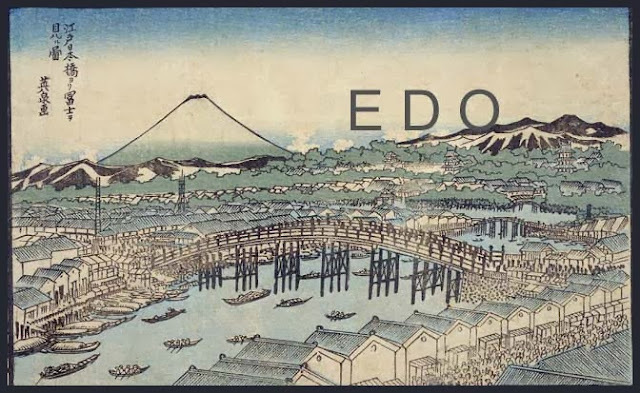 The Koshu Kaido was especially planned by Tokugawa Ieyasu to secure his route to escape Edo in case of an attack. He had a group of 100 special armed guards live in Shinjuku to help and protect him in case of need.
. Hyakuninchoo　百人町 Hyakunincho district . From Sekino-shuku (関野宿) there was a possibility to use the river 相模川　Sagamigawa to ship luggage coming from Kyoto to the coast (now to the towns of Chigasaki and Hiratsuka) and from there by boat to Edo.
. 甲州裏街道 Koshu Ura Kaido . Another fast exit road from Edo.
. Yotsuya 四谷 / 四ッ谷 Yotsuya district - "four valleys" - Shinjuku .
. 3. 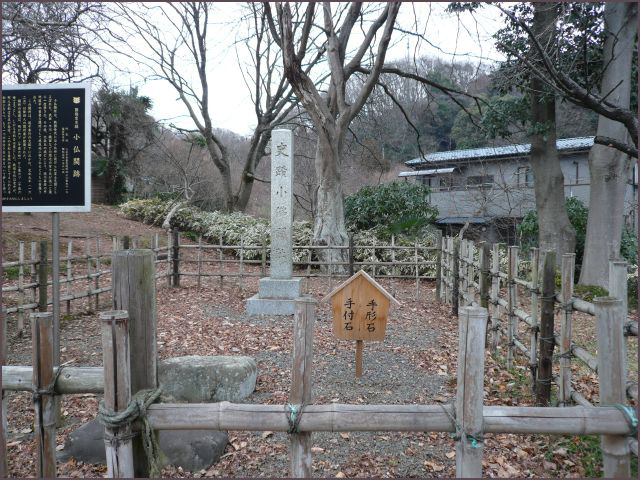 Kamitakaido-shuku (上高井戸宿) (Takaido, Suginami).
. 9. Fuchū-shuku (府中宿) (Fuchū, Fuchu) .
. 11. Hachiōji-shuku (八王子宿) (Hachiōji, Hachioji) . There was a special barrier (sekisho　関所) to prevent women to get out of Edo and weapons to come into the town. The barrier was beside a steep river. 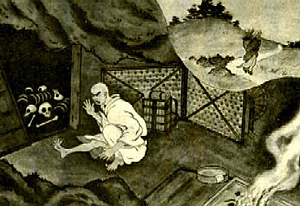 At the barrier were two stones, one for the traveller to place his hands 手付き石 tetsuki ishi, while the official checked his papers, and one to place his papers in front of the official 手形石 tegata ishi. Also called 富士見関 because Mount Fujisan could be seen from here. There were no lodgings at this station. 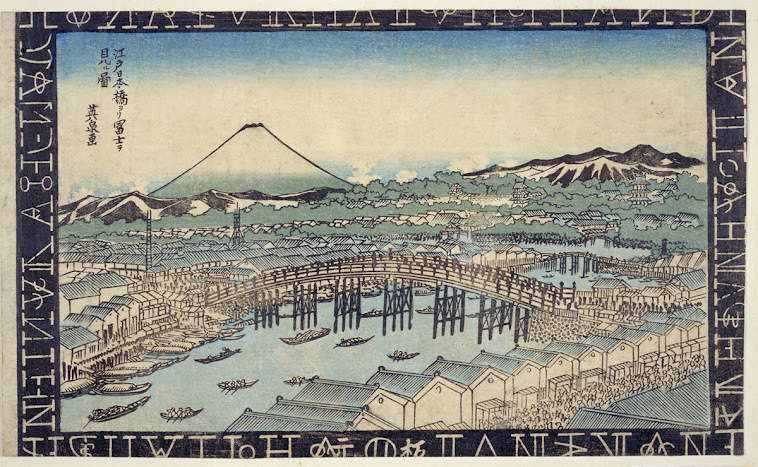 It was famous for its 猿橋 Saruhashi, the "Monkey Bridge". Located in Otsuki is one of Japan's most famous bridges. 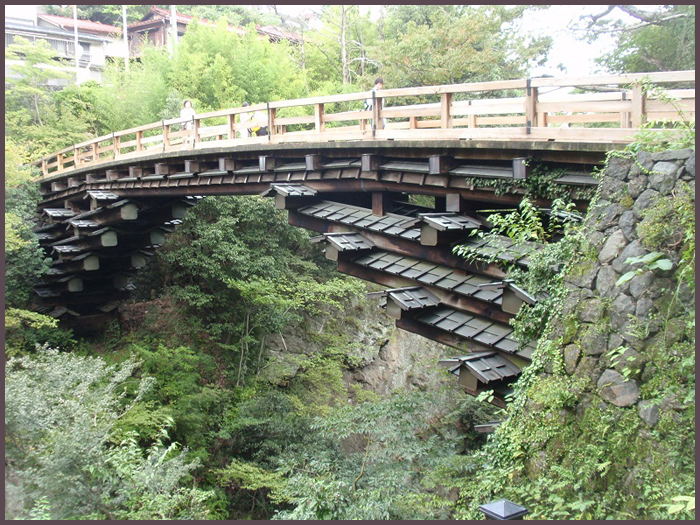 The 1300 year old wooden bridge crosses the Katsura River in Yamanashi as it flows between two high cliffs. The ingenious cantilevered design is said to have been inspired by monkeys holding hands to cross the river. Obviously it must have been rebuilt many times, but the basic design has never been changed.
. Kunitachi 国立市 Kunitachi town . lies along the historical Kōshū Kaidō. There are various legends along the Koshu Kaido. Even Momotaro, the Peach Boy, was here! 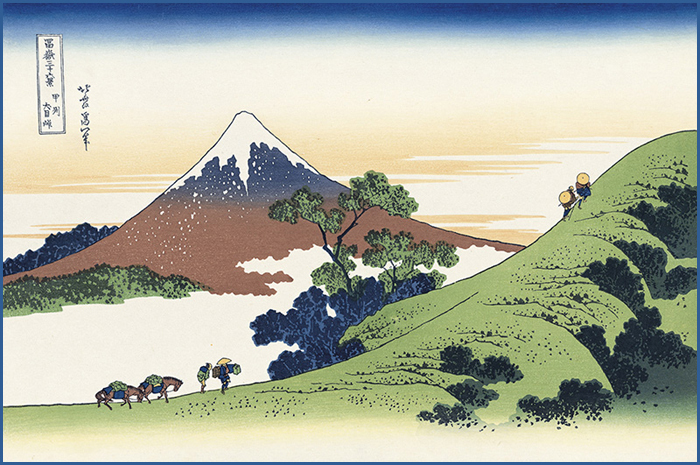 From the mountain in the North of the road, called 百蔵山 Momokurayama (momo is a pun with momo 桃, the peach) the peach came rolling down the river. It was picked up at 鶴島 Tsurushima (Tsurukawa) in 上野原 Uenohara. From this peach Momotaro was born. When he grew up, he got his helpers, the dog from 犬目 Inume, the 雉 pheasant (bird) from 鳥沢 Torizawa and the monkey from 猿橋 Saruhashi.
. Kukiyama 九鬼山　"Mountain with Nine Demons" . used to kill and eat travellers on the Koshu Kaido. From others she extracted money or valuable things. the Old Koshu Road . . .
. Tomiyasu Fuusei 富安 風生 Tomiyasu Fusei . Usually a ritual at a shrine at the foot of the mountain, with members then climbing the mountain for the first time in this new season.